The B-737 NG Walk Around book is approximately 94 pages in length. 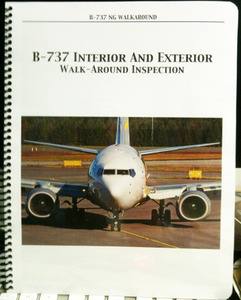 It describes in detail, pre-flight inspection of the B-737. Begins with the cockpit setup, moving to the cabin, and then inspecting the airplane in a clockwise direction starting at the nose. Table of Contents in front and Index in the back. It has a set of photos where something is wrong and the reader must identity the abnormality. Coil bound, 8.5 x 11". Color printed on high quality Mohawk paper.